It has been an amazing first two rounds of March Madness, with upsets and close games, and fan brackets shot to “h-e-double-hockey-stick.” But it’s not over, so to inspire your tourney menu we bring Grill Madness, a collection of recipes to put your game day extravaganza over the top. Our second installment is Caribbean Jerk Chicken – spicy, bold, and incredibly addictive. This grilled chicken brings sizzling excitement to your senses making it the perfect pairing for your March Madness festivities. 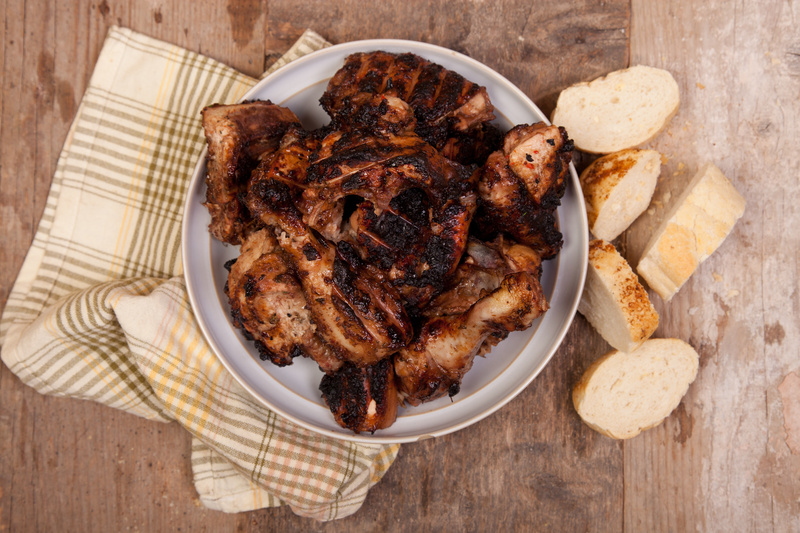 The essence of Jamaica’s popular jerk sauces is captured with this fiery and fragrant grilled chicken. This recipe calls for three whole chickens cut into eight pieces, but could easily be used with only drumsticks and/or wings. For maximum flavor and punch, let the chicken marinade for 24 hours. With over 15 ingredients, this is the most flavorful marinade bringing awesome heat and color, and to ease the heat (and pain…), fresh jalapenos can be substituted for the Scotch bonnet chiles. Super simple, this recipe is perfect for entertaining because it can be prepared the day before, then thrown on the grill 30 minutes before game time. So fire up the grill, grab your iced beverage of choice, and get ready for the madness in your mouth and on the court. In a food processor, combine all of the ingredients, except the chicken, and process to a paste. Put the chicken pieces in a very large bowl and pour the marinade on top. Toss to coat the chicken thoroughly. Cover and refrigerate overnight. Light the grill. Remove the chicken pieces from the marinade, leaving on a coating of spice paste. Grill the chicken over moderately high heat, turning often, until the skin is nicely charred and the chicken is cooked through, about 30 minutes.